The Spaniard from Mallorca, Rafael Nadal has been a mainstay of men's tennis for over close to a decade and a half now and the man with the second highest Grand Slam tally of all-time is not done yet. We all know what a remarkable player Rafa is and his clay court record in general and French Open accolades, in particular, are much known. But wouldn't it surprise one if one is told that Rafael Nadal has won more matches outdoors than any other athlete in the Open Era? What makes Rafa so special is that he was able to shed the image of being a dominant player on only one surface long ago. He is, in fact, the youngest player to have completed a Career Slam - he achieved this at the US Open of 2010. Rafael Nadal is one of only two men in the Open Era along with Pete Sampras to have won Grand Slams in teenage, 20s and 30s. 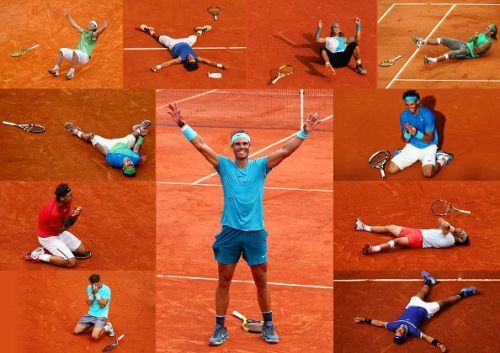 In fact, Rafael Nadal is the only athlete to have won at least one Grand Slam trophy for 10 consecutive years. Since winning his very first French Open title in 2005, Nadal has won at least one Grand Slam in every year from 2005 to 2014 inclusive. The streak finally came to an end in 2015. The two players who came closest to this record are Bjorn Borg, Pete Sampras and Roger Federer who won at least one Grand Slam for 8 consecutive years. Gone are the days when teenagers used to win Grand Slam titles at least in the men's game. Considering that men in today's game peak a bit late, it is impossible to envision someone emulating Nadal's benchmark.